Jeff Graham (Dr. Jeff) is a cognitive psychologist with interests in computer-assisted instruction, neural network modeling, and health psychology. He received his M.A. from the University of Western Ontario and his Ph.D. from the University of Waterloo. 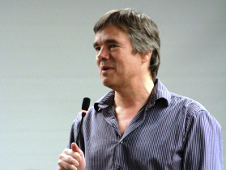 As an Associate Professor at the University of Otago (Dunedin, New Zealand) Jeff developed connectionist models of children's arithmetic and studied an accelerated learning curriculum for early childhood mathematics. Since 1988 Jeff has used computers to teach psychology. With the help of many student volunteers Jeff and his colleagues have developed educational software projects like Sniffy, the Virtual Rat, a simulation of behavioural concepts in learning, and DeckChair Tutor, an online learning toolkit for teaching, assessment, and psychology experiment hosting. Dr. Graham was hired in 1992 to design and implement the computer-laboratory component of PSY100 - Introductory Psychology. He develops new lab exercises that make appropriate use of multimedia technologies and fill in the gaps in the topics covered during lectures. Dr. Graham (and the Psychology Club) offer sessions for students and friends to learn a relaxation technique that calms the mind, releases stress, and opens a door to our unconscious sources of creativity. The meditation routine is a combination of "progressive relaxation" taught at Harvard by Herbert Benson as the "the relaxation response" and more ancient techniques used by mystics in many different religions. With 84 computers in the Deerfield Hall computer lab we schedule 18 lab sections to handle 1500 students enrolled in PSY100. We have 2.7 Ghz Intel Core i5 iMac computers for our student workstations. Each machine has 8 GB of RAM and a 999 GB hard drive, and a high-speed CD-ROM superdrive. These machines make internet browsing and complex computations very quick and easy. DeckChair Tutor is a web-based learning software platform for presenting content and recording student learning and performance online. It has been developed over more than 10 years for use in the PSY100 computer lab. With the University and the UTM Psychology Department’s help, Dr. Graham and colleagues formed DeckChair Learning Systems Inc. (deckchairtutor.com, deckchairlearning.com) to commercialize this invention. The start-up company was awarded funds from the Ontario Centres of Excellence (OCE - Market Readiness) in 2008 and 2009. The 5th edition of "Sniffy, the Virtual Rat," was released in 2012, an operant-conditioning simulation which has won design awards, been written up in magazines like The Economist, and appeared on TV news shows and CNN's Science & Technology Week. Our publisher has informed us that Sniffy is now considered a best-seller (over 100,000 copies sold in US/Can/Europe/Australia/NZ). and then click on the Tutorial link under the Book Resources.